The National Endowment for the Arts; this concert was supported by a grant from the New York State Music Fund, established by the New York State Attorney General at Rockefeller Philanthropy Advisors. Hallwalls is pleased to welcome master of the trombone and a true living legend of American music, Roswell Rudd, for a five-day residency project working and performing with Buffalo musicians. 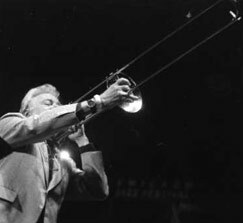 Roswell Rudd is proudly of the tradition that has given us such jazz trombone greats as Jack Teagarden, Kid Ory, J.J. Johnson, and Joseph Nanton. One of the most imaginative, stimulating players, Rudd is known for his work with groundbreaking groups and musicians like Herbie Nichols, the NEW YORK ART QUARTET, Cecil Taylor, Archie Shepp, Carla Bley, and Steve Lacy. His trailblazing on the trombone has influenced an entire generation of trombonists who see his extroverted gutbucket stylings as the modern incarnation of the New Orleans style. He has equally a passionate lyricism in the tradition of American folk songs and ballads. He has nine solo recordings including the well known EVERYWHERE, Rudd's Sextet (1966; Impulse), which was re-released in 1998 by Impulse and included the Cecil Taylor Unit in which Rudd performs as well; FLEXIBLE FLYER, (1973 and 1998; Arista Freedom), and REGENERATION (1982 and 1998; Soul Note). He has been a featured soloist on numerous other recordings and in 1999 Steve Lacy & Roswell Rudd's MONK'S DREAM was released on Universal/Verve. Roswell Rudd has not only received international recognition as a performer, but as well for his compositions and arrangements ranging from large scale music dramas to instrumental jazz suites. His jazz-operas BLUES FOR PLANET EARTH and GOLD RUSH have achieved cult status from their performances in the 1960's. In 2000 he was awarded a Guggenheim Fellowship in composition and in 2003 was voted Trombonist of the year by the Jazz Journalists Association. Rudd has a working ensemble (with Buffalo musicians John Bacon and Greg Millar) that performs unpublished works of Herbie Nichols and original Rudd material. Rudd's two releases of THE UNHEARD HERBIE NICHOLS are on CIMP. 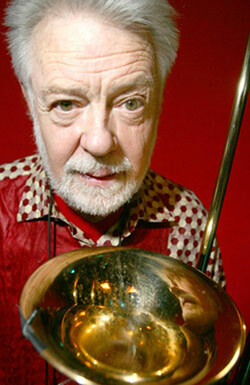 Rudd performs and tours regularly as the STEVE LACY-Roswell Rudd QUARTET. In June 1999, Rudd participated in the 35th Reunion concert of the NEW YORK ART QUARTET which has since toured internationally. Their recording on DIW was released in February 2000. His most adventurous and ambitious solo project ever b r o a d s t r o k e s was released in May 2000 on the Knitting Factory Label and received four Grammy nominations. In September 2000 he reunited with Archie Shepp and Archie Shepp/Roswell Rudd LIVE IN NEW YORK was released on Universal in February 2001. On and off for a period of three decades, Roswell Rudd assisted Alan Lomax with his world song style project and the wealth of information on the music of this planet inspired him to collaborate beyond the periphery of western music. MALIcool, was recorded in Bamako, Mali in 2001 with both Malian and American musicians. Mr. Rudd is completing a new CD with the Puerto Rican legend of the cuatro, Yomo Toro. He also brought his TROMBONE SHOUT BAND to perform at the 4th Festival in the Desert in Essakane, Timbuctou, Mali. In 2005 he extended his reach even further, recording a CD with a traditional music group from Mongolia, entitled Roswell Rudd & The Mongolian Buryat Band, Blue Mongol. Rudd has taught extensively including positions at Bard College, The University of Maine, New England Conservatory and given seminars and Master Classes including Bennington College and Harvard University, as well as other colleges in the USA and abroad. Rudd is one of the giants of post-bop jazz. His active playing force is to be greatly welcomed, with his larger-than-life individualism. b. 17 November 1935, Sharon, Connecticut, USA. Rudd studied singing and French horn at college and theory at Harvard (1954-58). Like several other members of the 60s avant-garde he began his jazz career playing Dixieland, a fact that points up the line of evolution between the New Orleans roots and the New Thing, and his big, fulsome trombone sound strongly recalls the early “tailgate” players, even when he is working in the most abstract surroundings. Rudd moved to New York in 1954 and played in various traditional bands. He began to work in a modern context with Herbie Nichols (1960-62) and in 1961 he joined Steve Lacy (who also started out playing traditional jazz). His conversion to free-form jazz began as a result of meeting Bill Dixon. In 1964, he formed the New York Art Quartet with John Tchicai, to whom he had been introduced by Dixon. When the Quartet disbanded in 1965 he became a member of Archie Shepp's highly influential group until 1967, playing on Four For Trane and Mama Too Tight. In 1968, he formed the Primordial Quintet (which ended up as a nine-piece band) with Lee Konitz. During the late 70s and 80s he toured extensively with his own groups, and in 1982 was reunited with Lacy in the Monk Project with Misha Mengelberg. He has also worked with Cecil Taylor, Jazz Composers Orchestra (who, in 1973, commissioned the Numatik Swing Band from him), Albert Ayler, Karl Berger, Enrico Rava, Perry Robinson, Gato Barbieri, Robin Kenyatta and Charlie Haden's Liberation Music Orchestra, and in 1961 he appeared in the movie The Hustler. He has also worked with Alan Lomax, and became professor of Music Ethnology at the University of Maine. He has tried to show the connections between jazz, so-called ethnic music and the European classical tradition in his compositions. In the early 90s after taking a degree in nursing, he began playing Dixieland again in upstate New York. He returned to recording in the late 90s, working with Lacy, Elton Dean, and the New York Art Quartet.